Back at E3 I said Capsule Force was some of the most fun I’ve had with a local multiplayer game. For as much of that was born of out of the circumstances – the atmosphere, the people – I still stand by that statement. Developed by Klobit Games, Capsule Force pits two teams of two players each in a game of tug-of-war. Both teams are trying to move one of two platforms to the right or left sides of the level. The goal is to reach the opposing team’s base and steal their capsule through a combination of firepower and swift maneuvering, though mostly the former. Think Nidhogg but with guns instead of rapiers and you’ll get the idea. You move and direct your arm-cannon with the left stick and fire by pressing the square button, while holding it down turns it into a charged laser beam. Shots can be deflected with a shield or avoided entirely by dashing. Aiming and controlling your character with the same stick sounds cumbersome on paper, but works splendidly in execution. Precision’s not required – haphazardly shooting usually gets the job done – but it’s also a breeze to fire with accuracy while jumping about. Of course, accuracy doesn’t matter in the heat of battle. From the word “go,” Capsule Force erupts into all out mayhem. Blaster shots fill the screen as everyone leaps about the stage trying to move one of the platforms forward. Bullets bounce as shields are deployed, crisscrossing lasers leaving nary a safe spot to hang. It’s tough to follow at times due to the constant chaos, but it’s also where the game shines brightest. For as much as it looks unorganized, there’s always a sense of teamwork, of strategy at play. It’s especially evident in one-on-one battles. It takes on a more methodical quality where both participants focus more on evading each other to maintain their momentum rather than engage in needless conflict, shots flying with more directive than the blitz of four-player combat. Unlike a lot of its contemporaries, Capsule Force doesn’t suffer from the problem of all skill being thrown out the window with four players, even on its most absurd stages. Each of the eight stages has its own hooks. Stone totems rise from the ground in Hidden Woods to bar your way, blasting a particular spot being the only way to clear them. An amorphous creature chases you in Zero Dimension, invulnerable to your attacks and slaying you on contact. Bubbles knock you around, disruption fields block all but your ability to jump, and so on. The “alt” versions of each stage compound those obstacles to create extra treacherous stages. One removes all solid ground while another breaks the terrain into a checkerboard of tiny blocks. 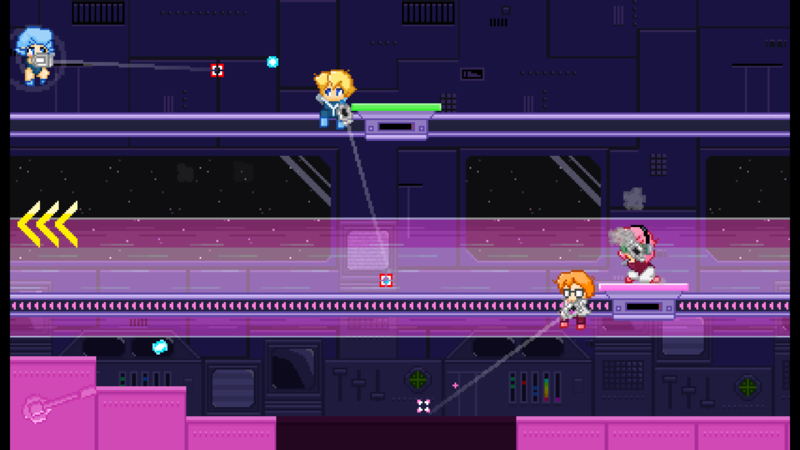 If multiplayer is out of the question, Capsule Force has a series of missions to tackle. They’re time trials that use remixed versions of the multiplayer stages to test you through things as shooting targets, navigating obstacles, dashing, and so on. The faster you clear them, the better grade you receive. Getting a passing grade on them is relatively easy, but the fun comes from attempting to master them. Chasing those coveted S-ranks is borderline maddening due to the low margin for error, but satisfying all the same. Still, they’re more of a nice supplement at best, for the multiplayer is still the main draw. As with all games of this sort, your mileage will vary on whether you have anyone to play with. Capsule Force’s missions provide some fun, but they won’t hold your interest for long. You can certainly sink a lot of hours into perfecting them, though it’s tough to recommend the game based on that mode alone. If you do have folks to play with, however, Capsule Force is a fantastic addition to the growing pantheon of local multiplayer games.